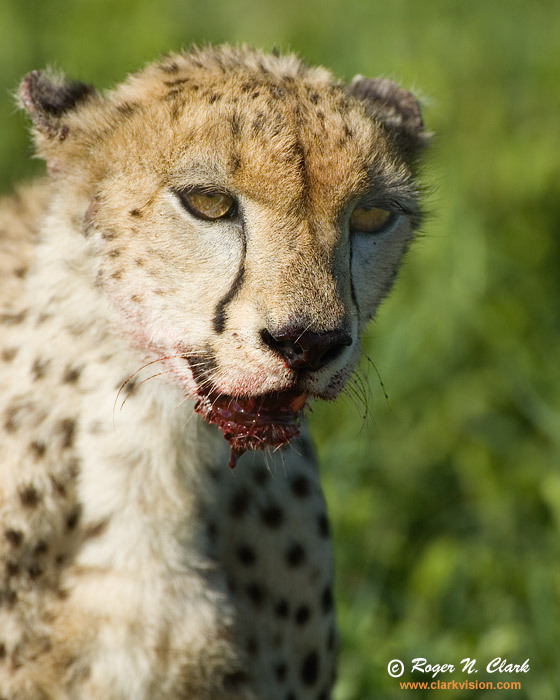 This cheetah (duma in Swahili) had just killed a gazelle (swala in Swahili) on the Serengeti in Tanzania, Africa, and was feasting on the afternoon meal. He looked around to be sure no other predators were coming to try an take the kill. Technical: Canon 1D Mark II 8-megapixel camera, Canon 500 mm f/4 L IS lens plus a 1.4x teleconverter giving 700 mm at f/5.6. Exposure: 1/1600 second at ISO 200.